Mom got home from day hunting last night, and made dinner right away. She wanted to be sure she got to eat a hot meal in case we lost electricity. My beef stinky goodness is on the left. Mom's stupid egg frittit-titiitta thing with mushrooms and spin-nach, her dumb green leafy roo-gala and bread (without butter) on the right. Which one of us got the better dinner? You all know that hurricane Sandy is coming. 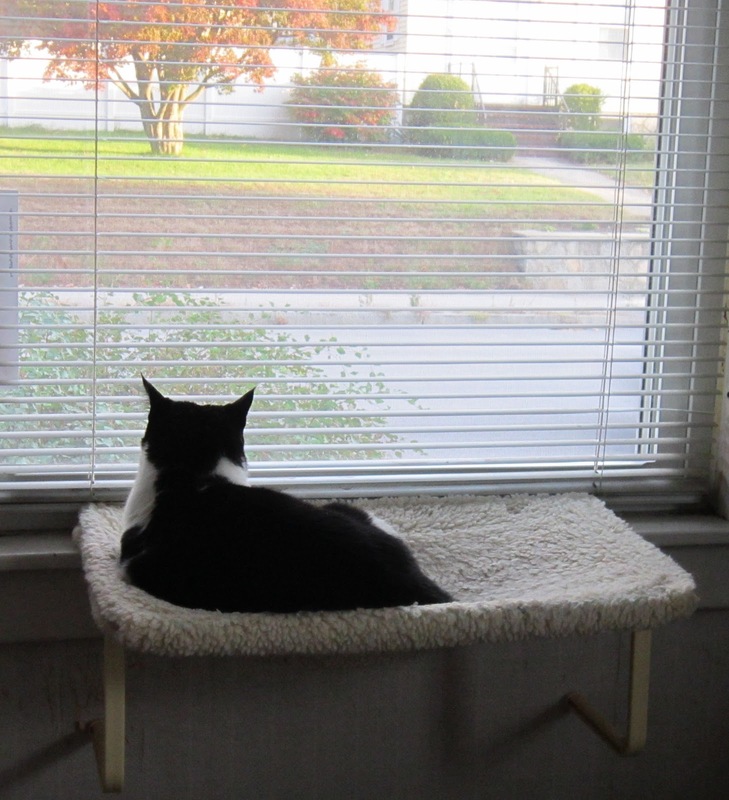 She's not coming HERE, but her winds will visit us here in New Hampster and may knock out our electricity. Mom is all stocked up with foods for both of us, and we have flashlights and batteries. Let's hope that all our friends in the mid-Atlantic region and Mew Jersey are all safe and sound. I'm gonna be camped out behind the recliner on my soft fleece pillow. See ya later! 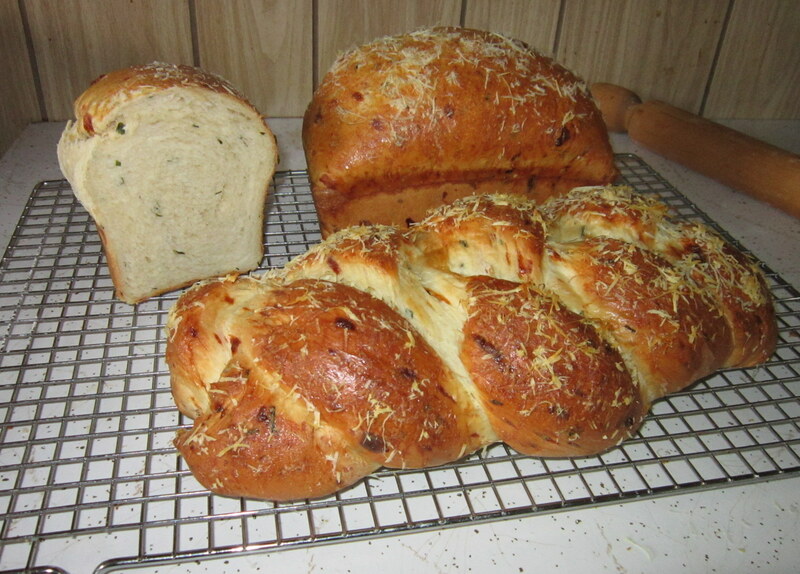 Mom baked some of her famous bread earlier today. (You can get the recipe, and how-to instructions here.) Mom added some fontina cheese and chopped chives. I thought it looked pretty good, so when she started eating a piece of bread with butter, I thought it smelled pretty good too. Mom set the bread down and let me check it out. I thought it was awesome, and proceeded to lick the butter right off that yummy bread. Yes, it was my own foods I was eating yesterday. 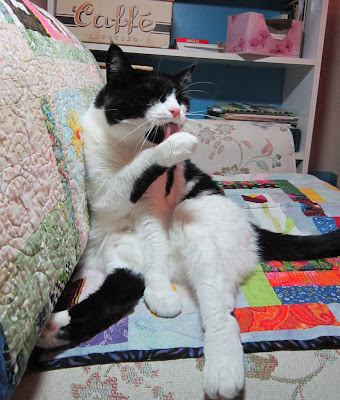 I was watching Mom get it ready, and when she turned away to rinse out the stinky goodness can, I dove right in. Mom buys nice bowls for me. The red ones are Japanese rice bowls. My stinky goodness always comes in a clean bowl, so I have a nice collection. 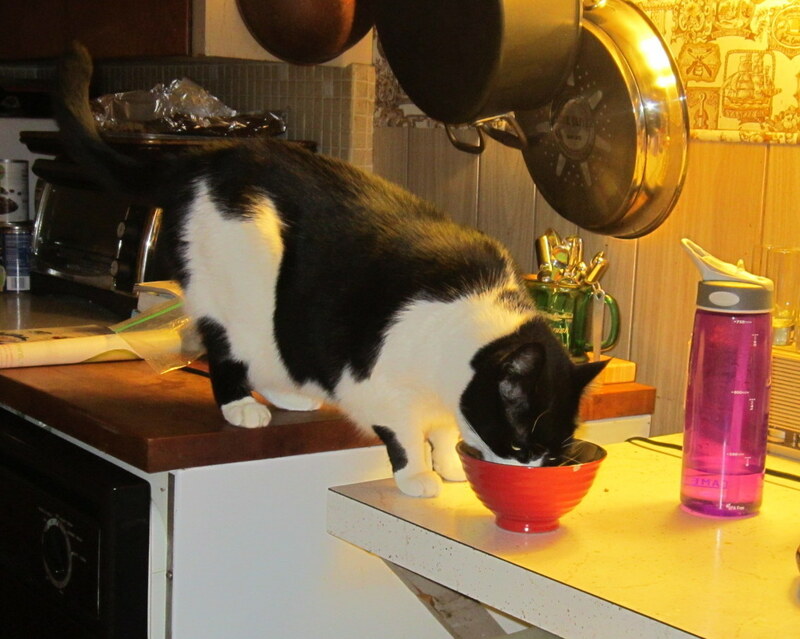 I don't usually eat on the counter (sometimes the counter is full of dirty dishes and I can't get up there) but Mom loves me, so a lot of the time most of the time I can do what I want. I was really hungry. I mean, like really. Today, Monty's Caboose is one year old! Can you believe it? Mom and MomBean were Skypeing on Sunday and get this... the Caboose is walking!!! Mom and I would like to ask all our friends (furry, feathered and otherwise) to send some kind thoughts and purrs to Illinois, where Mom's quilty idol, Wanda, lives. Wanda has to see a specialist today about a very serious medical issue and needs all the positive vibes she can get. 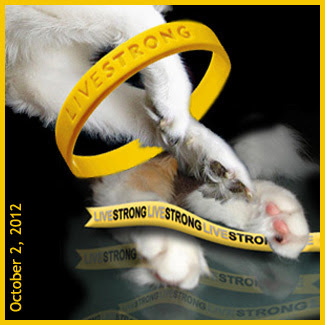 Mom thanks you from the bottom of her heart, and I thank you from the bottoms of my furry feet. No, not MY teeth. MOM has to visit the Tooth Vet today for a checkup. She says it's a necessary evil. Glad it's her and not me. I have been doing the usual. Napping, eating, demanding scritches, avoiding the flashy box. Mom's hasn't exactly been chasing me down with it. Lately she's been tippy tapping. No sewing, just tippy tapping. I try to sit by to get scritches, and I get a few, but she says she needs both hands for tippy tapping so I don't get as many as I'd like. But I do curl up next to her and nap. That's good. Just another boring day in my corner of New Hampster. Mom got all her chores done this past weekend, and I helped. She even made all her lunches for this week, which is kind of a big deal. It means no scurrying around like a crazy woman in the mornings. She has one quilt she is working on for our friend R, who will be visiting for Turkey Day. Mr Karate is in Oregon. He spent almost three weeks in Yosemite National Park with his uncle, Mr Photographer while MrP climbed El Cap twice. Mom was happy to hear from both of them, and they had a nice conversation on Skype. Mom and I watched our friends, the guys named Pat, yesterday, and Mom was scowling for a lot of it. I dunno how this season is going to shake out, but I'm not holding my breath. Everything is is pretty good here in our little corner of New Hampster. One of the advantages of hiding out behind the recliner is that Mom pulls the quilt onto the front of the recliner so I can have enough room to be comfy. Of course that means I can fit under it. Mom was driving home from day hunting when she heard a terrible CRACK and something banged on her (brand new) metal masheen. She was in traffic (whatever that is) so she couldn't do much but keep going. The sun was in her eyes, so she had to be very careful. By the time she got home, everything looked normal. But the next day she got in it and saw a crack in the windshield. She missed it the day before because the visor was down. So she called the insurance guys and they have to replace the windshield. This is not as bad as it sounds because Mom has something called "comprehensive" which means she does not have to spend any green papers to fix it. In fact, they will come to her day hunting place and fix it while Mom is hunting bits and bytes. Mom is trying to think of this as merely "amusing" but the fact is, she's had two incredibly unlucky things happen to this new metal masheen. The old one she traded in had nothing wrong with it and never gave her any trouble at all. This is my new favorite napping spot, in the corner behind the recliner. 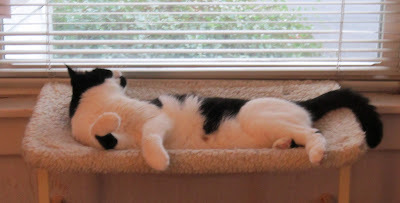 There are radiators on each wall beside me, so it is a nice warm spot. As you can see, Mom has placed my heated cat cup nearby to tempt me, but I am not falling for that. Last night, while I was napping on the recliner, and Mom was eating her dinner, the house started shaking and rumbling and making noise. Mom looked up. The stuff in the dungeon was making a heck of a racking. Dishes were clinking on the shelves. The house was MOVING! It lasted a long time. Mom jumped up and looked around. She went to the window, to see if it was the wind. Nope. She went out onto the porch, to see if the neighbors or somebody drove a car into the building, even though she knew an ordinary metal masheen could not make the house move that much. She looked over at me. I looked back. Finally, she gave up wondering and went back to eating. When she was giving the dirty dishes a bath later, she wondered if maybe we had had an earthquake. She got on the computer and found the news.... Yes! This area experienced a 4.6 earthquake, and the epicenter was about an hour's drive away. That freaked Mom out but good. She called Mim-may to see if she had felt it. She turned on the news. Everybody felt it. Mom says she remembers another, much smaller earthquake when Mr Karate was a little kit. She hopes she never goes through one again. She was in a right tizzy. Me? I went back to napping. Mom's dragging the rug sucking monster around in the other room. I'm hiding out until it's all over. I am watching TV. 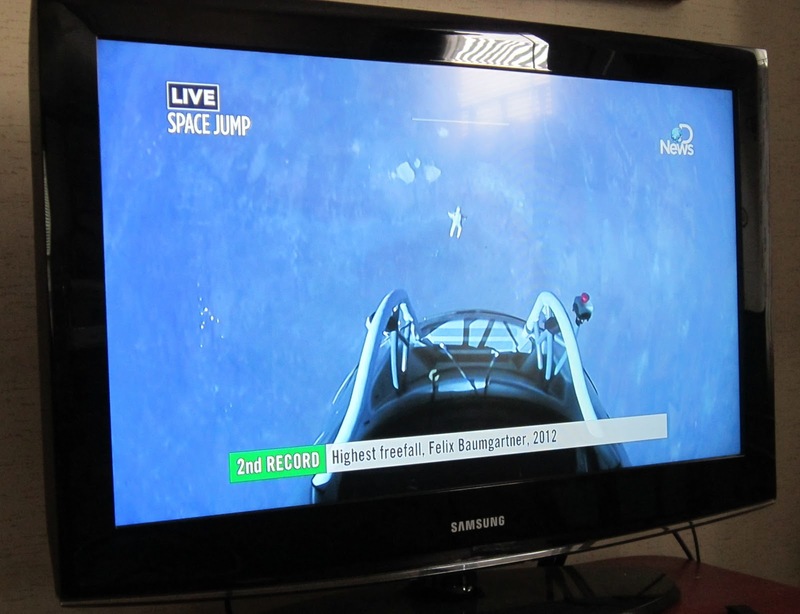 I am watching this guy, Felix, who is going to jump out of a capsule from the edge of space. The guy is nuts. But I want to see what happens. Because, I'm curious, you know. Holy carp! He did it! He even landed on his feet! I'm impressed! Mom was so nervous she almost stopped watching! P.S. Mom is tinkering with my blog template. Please bear with us until she gets it just right. Mom has finally finished the quilt she has been working on since February. You can see it over on her blog. That means now she'll clean the house. I am storing up my energy to fur it up again afterwards. Mom has got my heated cat cup ready for me. She plugged it in, but she is waiting to see if I will use it. The first year she bought it, I didn't use it. I didn't use it the second year either. Or the third. I used it the year after that, but not last year. 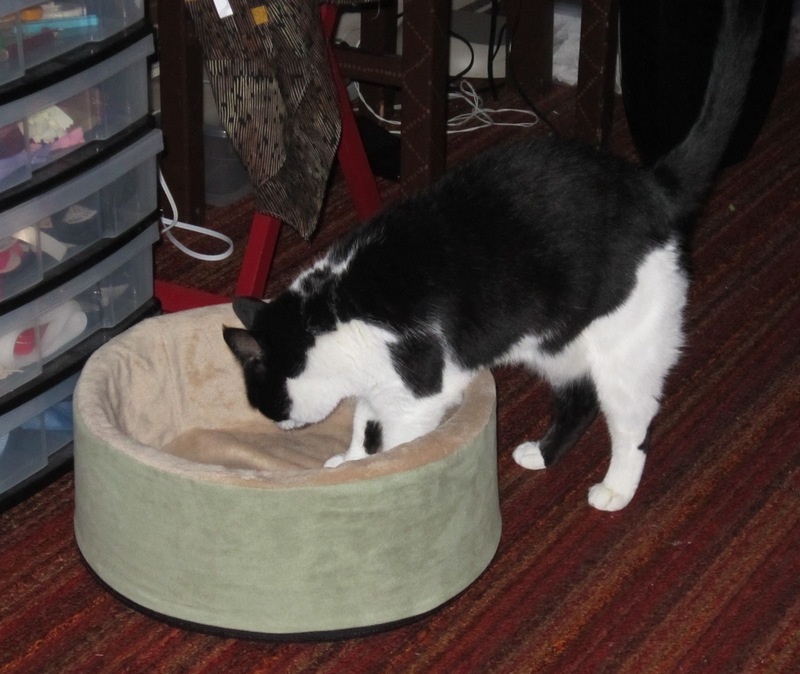 Mom is trying to convince me by moving it around and leaving treats in it. Naturally I am going to keep her guessing. Oh, there's nothing like a good bath! Mom has been working on her quilt, and I am helping. Yeah, I know I am napping on it and she doesn't like that, but hey, when Mom wants my help, I do my bit. 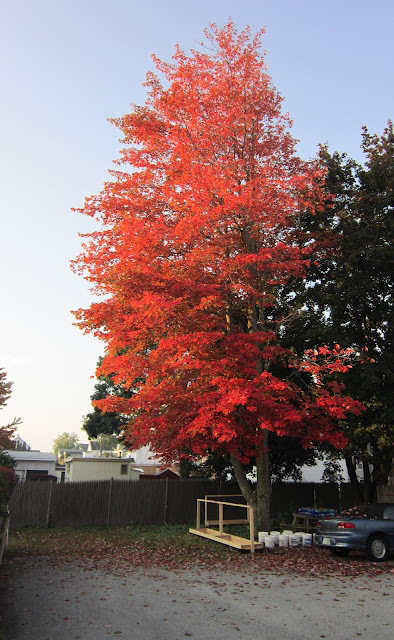 This red tree is proof positive that Autumn has arrived in New Hampster. Although "peak color" is still a week away here, this tree in the back yard always turns color early. Mom and I love looking at it. Mom had kind of a rough day yesterday day hunting. She got home snarky and upset. There are two ways to fix this. One is to sit on her lap, the other is to get her into her sewing studio. She chose sewing. I was nearby, keeping an eye on her. I'm glad the weekend is here. She needs to do something for herself. I have been sleeping near her at night, and napping close by when she reads her Kindle. 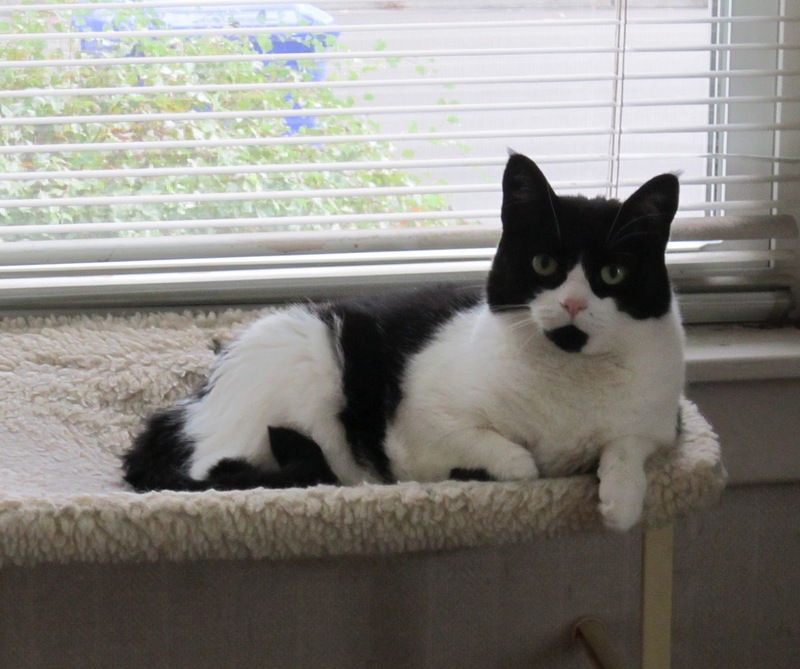 It is good work, and I wouldn't have it if I wasn't a formerly feral kitty. You all know how much I like to tease my Mom for not being Purr-fect (meaning she isn't smart like a Cat). I give her grief because I can. Mom's been working late at her day-hunting gig. She's been getting home very tired. The other day she came home TWO HOURS late! She fed me right away (like she always does.) Then she went into her room to change out of her work clothes, but stopped and looked at my fountain. She didn't like the look of it. There was a little bit of brown stuff floating on the surface of the water, and it was full of bubbles. "That's not right. Can't have our Millie drinking THAT!" and she picked it right up and carried it into the kitchen where she dumped out the water, took it apart, washed every square inch, every nook and cranny, then put it all back together, plugged it in, filled it up and made sure it was working fine. "Here you go, Millie, NOW you can drink!" Then she went to change and later made her own dinner. Kitties, it isn't the fact that she did it that proves she loves me. It's the fact she did it BEFORE she did anything else for herself. She got home two hours late, remember, and I know she was as hungry as I was. She was tired. But she saw there was a problem with the fountain and she fixed it RIGHT AWAY. And I am such a lucky cat to have such an awesome Mom. I would love to live in a world without Cancer. It's getting cooler outside, and I've actually been sleeping next to Mom at night. Mom says I can nap on any quilt in the house that's finished, but she'd appreciate it if I stayed off the quilts she is working on. 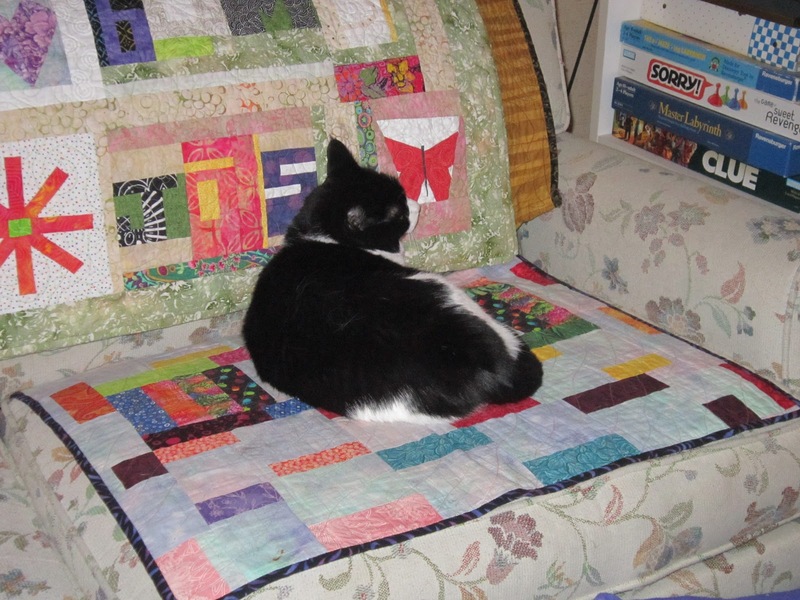 I told her (quite nicely) that if she doesn't want me lying on any quilt-in-progress she has to put it someplace else. 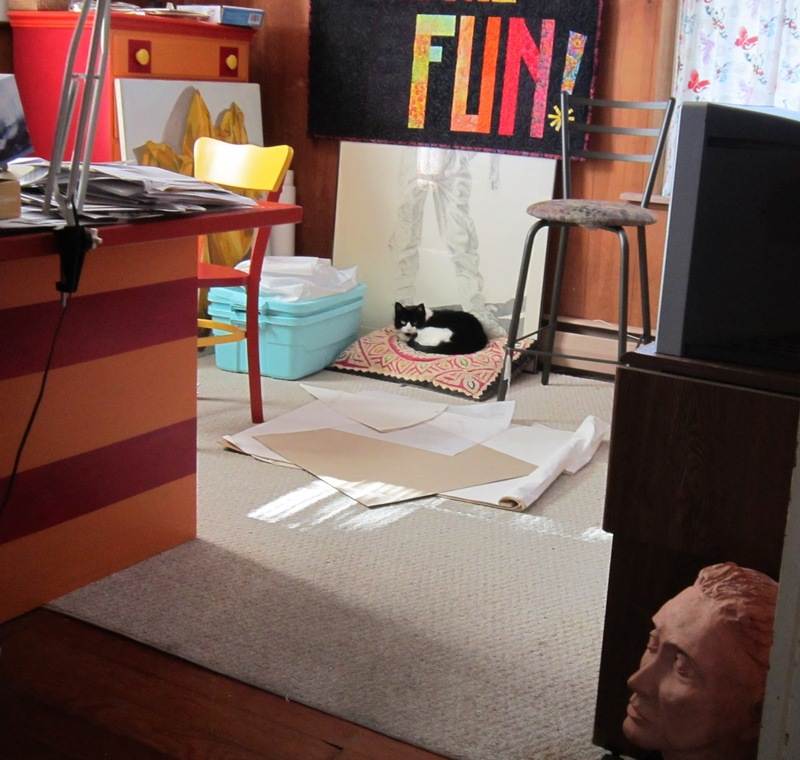 She knows I like to nap on the extra work table in her sewing room. Mom got a new tire for her metal masheen yesterday, so that adventure is all over with. She said it didn't cost as many green papers as she thought it would, so she was pretty happy about that.